NOTE: Don’t miss the poll question at the end of this post. 1. Extinction strikes in both the land and the sea. 2. On the land, while animals suffer repeatedly, plants tend to be highly resistant to mass extinctions. 3. Preferential disappearance of tropical forms of life during mass extinctions. 4. Tendency of certain groups of animals to experience them repeatedly (for example, trilobites and ammonoids). 5. Alleged equal spacing, or periodicity in geological time (occurring about every 26 million years). The Precambrian period was 4.6 billion to 523 million years ago. The Vendian period was 523-543 million years ago. Both Precambrian and Vendian periods host to at least one mass extinction each. The Precambrian era was a period in earth history before the evolution of hard-bodied and complex organisms. Throughout the extent of both periods, dominant Precambrian and Vendian organisms were soft-bodied, simple, and entirely marine. Diversification of the hard-bodied organisms did not occur until the beginning of the Cambrian, when the first shelly fauna appeared. Extinctions are proposed to have affected even life’s earliest organisms. About 650 million years ago, seventy percent of the dominant Precambrian flora and fauna perished in the first great extinction. This extinction strongly affected stromatolites and acritarchs, and was also the predetermining factor that encouraged the diversification of the following Vendian fauna. However, this distinct fauna, resembling modern-day soft-bodied organisms such as sea pens, jellyfish, and segmented worms also perished in a second extinction event at the close of the Vendian. This event, responsible for the demise of the Vendian organisms, may have been responsible for the ensuing diversification of the Cambrian shelly fauna. The first extinction of the Precambrian, which largely affected stromatolites and acritarchs, has been correlated with a large glaciation event that occurred about 600 million years ago. This event was of such severity that almost all micro-organisms were completely wiped out. The Vendian extinction, occurring near the close of the Vendian period, is currently under debate as to whether an extinction event occurred or not. Many paleontologists believe that the Vendian fauna were the progenitors of the Cambrian fauna. However, others believe that the Vendian fauna have no living representatives. Under this latter hypothesis, the Vendian fauna is believed to have an undergone an extinction, after which the Cambrian fauna evolved. Until more information can be collected, details on the Vendian extinction event will remain open to debate. The Cambrian period ranges from 543-510 million years ago. The most important animal group of the Cambrian were the trilobites. Four mass extinctions occurred during the course of the Cambrian period. During the Cambrian period the world was largely covered by epeiric seas, and existing organisms were entirely marine. At the beginning of the period, only small skeletonized sponges and molluscs were present, but by about the middle of the Cambrian, diversification of the shelly fauna occurred. The most important phyla present in Cambrian communities included trilobites, archaeocyathids, brachiopods, mollusks, and echinoderms. At least four major extinctions occurred during the Cambrian. The first extinction occurred at the Early Cambrian epoch boundary. During this event, the oldest group of trilobites, the olnellids, perished as well as the primary reef-building organisms, the archaeocyathids. The remaining three extinctions were irregularly distributed around the Late Cambrian epoch boundary, and as a whole, severely affected trilobites, brachiopods, and conodonts. The advancement of the theory of glaciation as the predetermining agent for the Cambrian extinctions has been developed by James F.Miller of Southwest Missouri State University. Through research undertaken by Miller, evidence of early Ordovician sediment of glacial origin has been uncovered in South America. Miller suggests in his hypothesis that this evidence of continental glaciation at the Cambrian-Ordovician boundary is responsible for a decrease in global climatic conditions. Such a decline in temperature is implied by Miller to destroy Cambrian fauna which are intolerant of cooler conditions, producing a mass extinction of mostly warm water species. He also suggests that a significant continental glaciation would bring large amounts of ocean water onto the land in the form of frozen glacial ice. This trapping of ocean water inevitably results in the decrease of sea-level and the withdrawal of shallow seas. Miller implicates that this reduction in sea-level would produce reduced habitat for marine species as continental shelves are obliterated. Ecological competition would consequently ensue, perhaps acting as a driving agent for extinction. The development of a hypothesis invoking the cooling and depletion of water in marine waters as a causative agent for the Cambrian extinctions has been advanced by several geologists, primarily Allison Palmer and Michael Taylor of the U.S. Geological Survey and James Stilt of the University of Missouri. The cooling and oxygen depletion would occur when cool waters from deep zones of the ocean spread up onto the continent, eliminating all organisms not able to tolerate cool conditions. The cooling would also result in stratification of the water column. Thus, species would ultimately perish due to their inability to tolerate dramatic shifts in such limiting factors as temperature and oxygen availability. Further research is required to more fully test the validity of the above outlined Cambrian extinction hypotheses. The Ordovician period was 510-438 million years ago. The Ordovician extinction happened 440-450 million years ago. The Ordovician extinction was second most devastating in earth history. The Ordovician period was an era of extensive diversification and expansion of numerous marine clades. Although organisms also present in the Cambrian were numerous in the Ordovician, a variety of new types including cephalopods, corals (including rugose and tabulate forms), bryozoans, crinoids, graptolites, gastropods, and bivalves flourished. Ordovican communities typically displayed a higher ecological complexity than Cambrian communities due to the greater diversity of organisms. However, as in the Cambrian, life in the Ordovician continued to be restricted to the seas. The Ordovician extinction occurred at the end of the Ordovician period, about 440-450 million years ago. This extinction, cited as the second most devastating extinction to marine communities in earth history, caused the disappearance of one third of all brachiopod and bryozoan families, as well as numerous groups of conodonts, trilobites, and graptolites. Much of the reef-building fauna was also decimated. In total, more than one hundred families of marine invertebrates perished in this extinction. The Devonian period ranged from 408-360 million years ago. A major intra-Devonian extinction occurred at the Frasnian – Famennian boundary. Following the Ordovician mass extinction rediversification of surviving groups occurred throughout the Silurian and Devonian. In addition, the Devonian saw the first appearance of sharks, bony fish, and ammonoids. During the Devonian the world’s oceans were dominated by reef-builders such as the stromatoporoids, and corals, and some of the world’s largest reef complexes were built. Terrestrial newcomers in the Devonian included amphibians, insects, and the first true land plants, giving rise to the first forests. The Devonian mass extinction occurred during the latter part of the Devonian at the Frasnian – Famennian boundary. The crisis primarily affected the marine community, having little impact on the terrestrial flora. This same extinction pattern has been recognized in most mass extinctions throughout earth history. The most important group to be affected by this extinction event were the major reef-builders including the stromatoporoids, and the rugose, and tabulate corals. This late Devonian crisis affected these organisms so severely that reef-building was relatively uncommon until the evolution of the scleractinian (modern) corals in the Mesozoic era. Among other marine invertebrates, seventy percent of the taxa did not survive into the Carboniferous. Amongst the severely affected groups were the brachiopods, trilobites, conodonts, and acritarchs, as well as all jawless fish, and placoderms. Evidence supporting the Devonian mass extinction suggests that warm water marine species were the most severely affected in this extinction event. This evidence has lead many paleontologists to attribute the Devonian extinction to an episode of global cooling, similar to the event which is thought to have cause the late Ordovician mass extinction. According to this theory,the extinction of the Devonian was triggered by another glaciation event on Gondwana, as evidenced by glacial deposits of this age in northern Brazil. Similarly to the late Ordovician crisis, agents such as global cooling and widespread lowering of sea-level may have triggered the late Devonian crisis. Meteorite impacts at the Frasnian-Famennian boundary have also been suggested as possible agents for the Devonian mass extinction. Currently, the data surrounding a possible extra-terrestrial impact remains inconclusive, and the mechanisms which produced the Devonian mass extinction are still under debate. The Permian Period was 286-248 million years ago. Terrestrial faunal diversification occurred in the Permian Period. About 90-95% of marine species became extinct in during the Permian Mass Extinction. With the formation of the super-continent Pangea in the Permian, continental area exceeded that of oceanic area for the first time in geological history. The result of this new global configuration was the extensive development and diversification of Permian terrestrial vertebrate fauna and accompanying reduction of Permian marine communities. Among terrestrial fauna affected included insects, amphibians, reptiles (which evolved during the Carboniferous), as well as the dominant terrestrial group, the therapsids (mammal-like reptiles). The terrestrial flora was predominantly composed of gymnosperms, including the conifers. Life in the seas was similar to that found in middle Devonian communities following the late Devonian crisis. Common groups included the brachiopods, ammonoids, gastropods, crinoids, bony fish, sharks, and fusulinid foraminifera. Corals and trilobites were also present, but were exceedingly rare. The Permian mass extinction occurred about 248 million years ago and was the greatest mass extinction ever recorded in earth history; even larger than the previously discussed Ordovician and Devonian crises and the better known End Cretaceous extinction that felled the dinosaurs. Ninety to ninety-five percent of marine species were eliminated as a result of this Permian event. The primary marine and terrestrial victims included the fusulinid foraminifera, trilobites,rugose and tabulate corals, blastoids, acanthodians, placoderms, and pelycosaurs, which did not survive beyond the Permian boundary. Other groups that were substantially reduced included the bryozoans, brachiopods, ammonoids, sharks, bony fish, crinoids, eurypterids, ostracodes, and echinoderms. Although the cause of the Permian mass extinction remains a debate, numerous theories have been formulated to explain the events of the extinction. One of the most current theories for the mass extinction of the Permian is an agent that has been also held responsible for the Ordovician and Devonian crises, glaciation on Gondwana. A similar glaciation event in the Permian would likely produce mass extinction in the same manner as previous, that is, by a global widespread cooling and/or worldwide lowering of sea level. Another theory which explains the mass extinctions of the Permian is the reduction of shallow continental shelves due to the formation of the super-continent Pangea. Such a reduction in oceanic continental shelves would result in ecological competition for space, perhaps acting as an agent for extinction. However, although this is a viable theory, the formation of Pangea and the ensuing destruction of the continental shelves occurred in the early and middle Permian, and mass extinction did not occur until the late Permian. A third possible mechanism for the Permian extinction is rapid warming and severe climatic fluctuations produced by concurrent glaciation events on the north and south poles. In temperate zones, there is evidence of significant cooling and drying in the sedimentological record, shown by thick sequences of dune sands and evaporites, while in the polar zones, glaciation was prominent. This caused severe climatic fluctuations around the globe, and is found by sediment record to be representative of when the Permian mass extinction occurred. The fourth and final suggestion that paleontologists have formulated credits the Permian mass extinction as a result of basaltic lava eruptions in Siberia. These volcanic eruptions were large and sent a quantity of sulphates into the atmosphere. Evidence in China supports that these volcanic eruptions may have been silica-rich, and thus explosive, a factor that would have produced large ash clouds around the world. The combination of sulphates in the atmosphere and the ejection of ash clouds may have lowered global climatic conditions. The age of the lava flows has also been dated to the interval in which the Permian mass extinction occurred. Following the Permian mass extinction, life was abundant but there was a low diversity of species. However, through the Triassic, Jurassic, and Cretaceous, major faunal radiations resulted in a large number of new species and forms. New terrestrial fauna that made their first appearance in the Triassic included the dinosaurs, mammals, pterosaurs (flying reptiles), amphibians (including frogs and turtles). In addition, the first birds appeared in the Jurassic. Among the terrestrial flora, the gymnosperms of the Permian remained dominant until the evolution of the angiosperms (flowering plants) in the Cretaceous. In the Cretaceous there was also major radiations occurring in several established groups including the the marine reptiles, rudist bivalves, ammonoids, belemnoids, and scleractinian corals. Bivalves, and brachiopods. Marine groups that were present but did not undergo major evolutionary expansion in the period included the gastropods,bryozoans, crinoids, sea urchins, and sponges. During the End-Cretaceous (K-T) extinction (65 million years ago) eighty-five percent of all species disappeared, making it the second largest mass extinction event in geological history. This mass mass extinction, extinction event has generated considerable public interest, primarily because of its role in the demise of the dinosaurs. 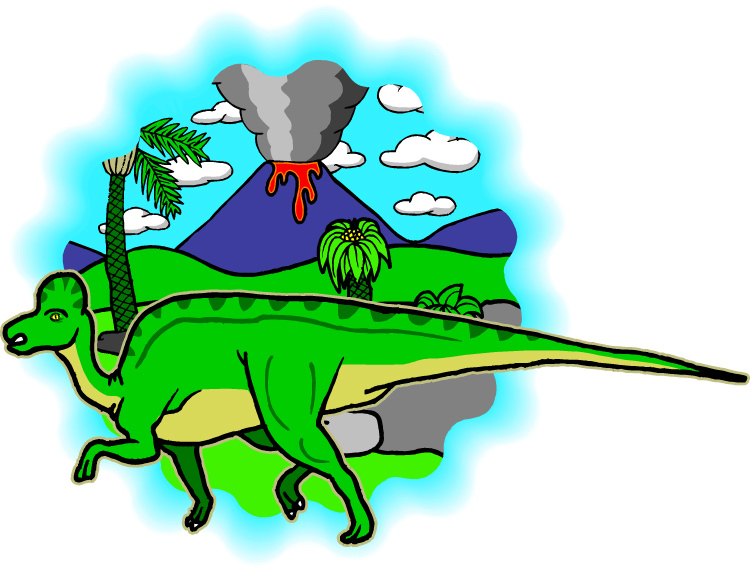 Although dinosaurs were among the unfortunate victims to perish in the K-T extinction, several other terrestrial and marine biotic groups were also severely affected or eliminated in the crisis. Among those that perished were the pterosaurs, belemnoids, many species of plants (except amongst the ferns and seed-producing plants), ammonoids, marine reptiles, and rudist bivalves. Organisms which were severely affected included planktic foraminifera, calcareous nannoplankton, diatoms, dinoflagellates, brachiopods, molluscs, echinoids, and fish. Remarkably, most mammals, birds, turtles, crocodiles, lizards, snakes, and amphibians were primarily unaffected by the End-Cretaceous mass extinction. The End-Cretaceous mass extinction has generated considerable public interest in recent years, in response to the controversial debates in the scientific community over its cause. The more prominent of these new hypotheses invoke extra-terrestrial forces, such as meteorite impacts or comet showers as the causative extinction agent. Older hypotheses cite earthly mechanisms such as volcanism or glaciation as the primary agent behind this mass extinction. Evidence for catastrophism at the Cretaceous-Tertiary boundary is found in a layer of sediment which was deposited at the same time that the extinction occurred. This layer contains unusually high concentrations of Iridium, found only in the earth’s mantle, and in extra-terrestrial meteors and comets. This layer has been found in both marine and terrestrial sediments, at numerous boundary sites around the world. Some paleontologists believe that the widespread distribution of this Iridium layer could have only been caused by meteorite impact. Further, these researchers cite the abundance of small droplets of basalt, called spherules, in the boundary layer as evidence that basalt from the earth’s crust that were melted and flung into the air upon impact. The presence of shocked quartz – tiny grains of quartz that show features diagnostic of the high pressure of impact – found in the boundary layer provides additional evidence of an extraterrestrial impact at the Cretaceous-Tertiary boundary layer. Recent research suggests that the impact site may have been in the Yucatan Peninsula of Mexico. The high concentrations of Iridium in the boundary layer has also been attributed to another source, the mantle of the earth. It has been speculated by some scientists that the Iridium layer may be the result of a massive volcanic eruption, as evidenced by the Deccan Traps – extensive volcanic deposits laid down at the Cretaceous-Tertiary boundary – of India and Pakistan. These lava flows came about when India moved over a “hot spot” in the Indian Ocean, producing flows that exceeded one hundred thousand square kilometers in area and one hundred and fifty meters in thickness. Such flows would have produced enormous amounts of ash, altering global climatic conditions and changing ocean chemistry. Evidence that volcanism was a primary extinction agent at this boundary is also relatively strong. In addition, and the presence of spherules and shocked quartz worldwide in the boundary layer may also have been the result of such explosive volcanism. Thus at present, both the volcanic and meteorite impact hypotheses are both viable mechanisms for producing the Cretaceous mass extinction, although the latter is more popular. The Holocene epoch is the geologically brief interval of time encompassing the last 10,000 years. With the evolution of humans beginning in the Neogene, humans have evolved into a significant agent of extinction. For example, David Western of the New York Zoological Society, has speculated that for the destruction of every two hundred square kilometers of tropical forest and one hundred thousand square kilometers of rangeland there is a resultant loss of hundreds, if not thousands, of species. Most of these have never been (or ever will be) documented by science. Deforestation, agricultural practices, pollution, overhunting, and numerous other human activities result in numerous species being threatened everyday. However, more information is required to see if the level of extinctions being experienced today are the harbinger of a mass extinction or merely reflect natural background levels of species replacement. This was taken from the following web sources. Most of text was copied directly with minor editing for spelling.